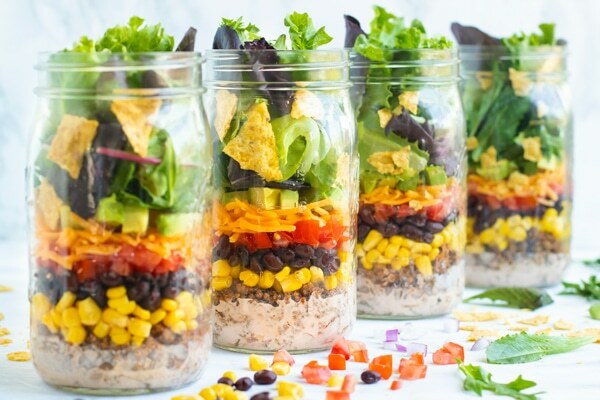 Take this Healthy Taco Salad recipe to work or school in a super convenient mason jar! Prep-ahead and have this easy mason jar salad recipe ready to grab-and-go. 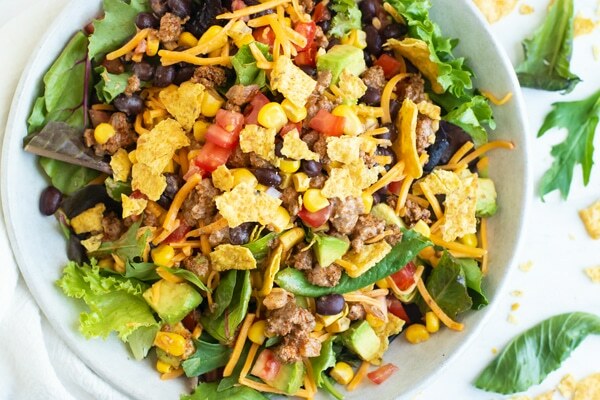 This taco salad recipe is made in partnership with Whole Foods Market 365. All thoughts and opinions are my own. Who else out there goes to the grocery store to brighten up their day just a bit? So when I discovered a new Whole Foods Market 365 opened up in North Austin (Hey, Cedar Park!) I had to go check it out. Not to mention, I also had a healthy taco salad recipe on the brain and needed to stock up my kitchen with all of the ingredients. Upon first entering I knew Whole Foods Market 365 was going to be right up my alley. It was not so big that I felt like I was going to get my workout in for the day at the grocery store, but big enough that it had all of the ingredients I needed to make this healthy taco salad recipe… including ORGANIC lean ground beef with no added hormones… that didn’t break the bank! And to be honest, none of the items I bought made my jaw drop at the price tags or the nutrition labels. 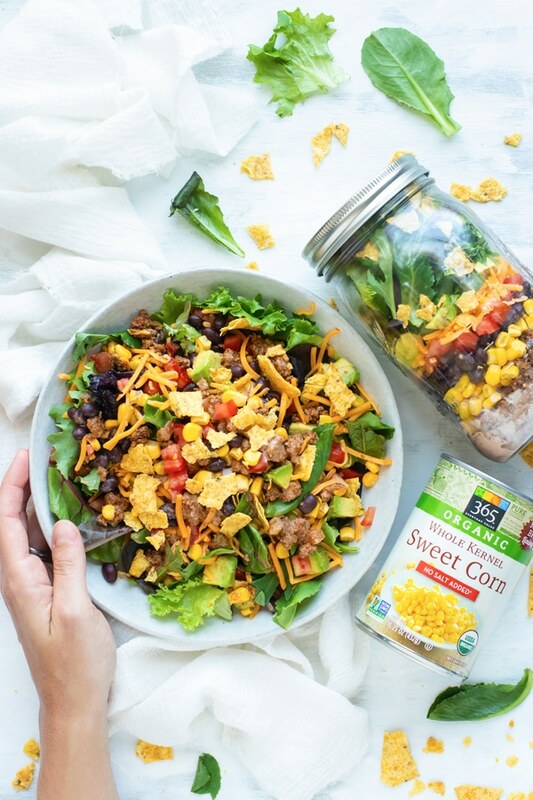 All of the products I purchased for this mason jar salad recipe can be found in Whole Foods Market 365, are non-GMO, and are free of artificial colors, flavors, and preservatives. I can’t tell you what a relief it was to not have to check EVERY. SINGLE. LABEL for these things! Are you someone that grabs whatever happens to be in the fridge for lunch or dinner? After I made these mason jar salads and put them in our refrigerator I found myself reaching for a SALAD to eat at lunch. Imagine that! The biggest hang-up I find when trying to eat healthy is actually prepping and preparing the healthy food when my hanger monster has taken over. So my solution? 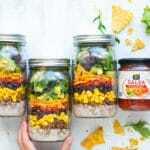 Make the healthy taco salad AHEAD of time and pack it into cute mason jars to enjoy throughout the week. So what exactly are the ingredients in this gluten-free taco salad recipe? Seasonings: Lots of delicious taco flavors! Whole kernel corn: Canned corn makes it super easy to assemble. Black beans: These help give you an extra bump of fiber. Tomatoes: You can use cherry, vine-ripened, or Campari tomatoes. Mixed greens: You can always substitute for spinach or kale. Tortilla chips: For an added crunch! Taco salad dressing: My secret weapon in this taco salad recipe! Feel free to swap out or leave out ingredients you do not like or that do not fit your dietary requirements. Think of this taco salad recipe as a blueprint for you to get creative with! Want to know my secret in this taco salad recipe? The taco salad dressing! And it’s so super simple. Find a really good ranch (you can find a few dairy-free ranch dressings at Whole Foods Market 365), pair it with a thick and chunky salsa, and voila! You have the perfect taco salad dressing recipe. Wide mouth mason jars are the way to go. They’re a lot easier to fill up and pour out. You will need a separate bowl to pour your mason jar salad contents into when ready to eat. Save the fresh ingredients for the night before/morning of. In this recipe you will want to put the avocado and mixed greens in at the last minute so they do not turn brown. You can either put the crunchy ingredients in the very top of the jar the morning of or in a separate zip-top bag to keep them from getting soggy. If you want to have warm ground beef on your salad simply empty out the contents on the top and then heat up the ground beef and taco salad dressing just before serving. 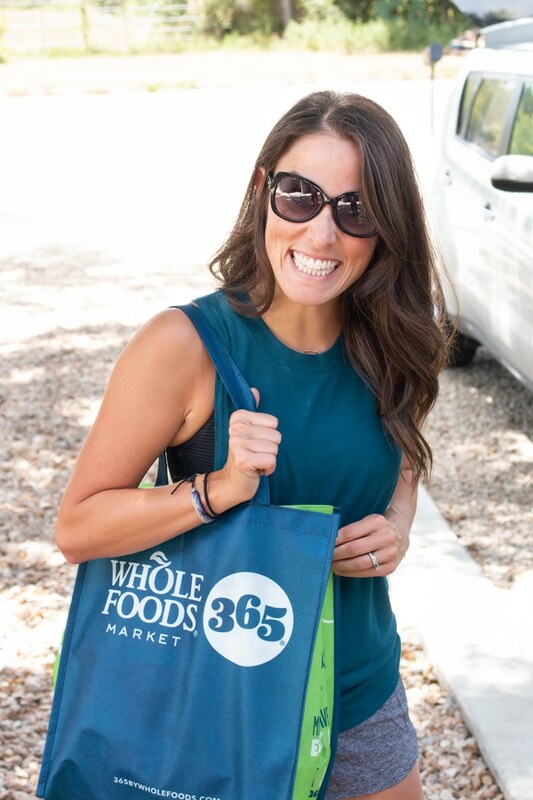 Don’t forget to check out the Whole Foods Market 365 if you live in the Austin area! 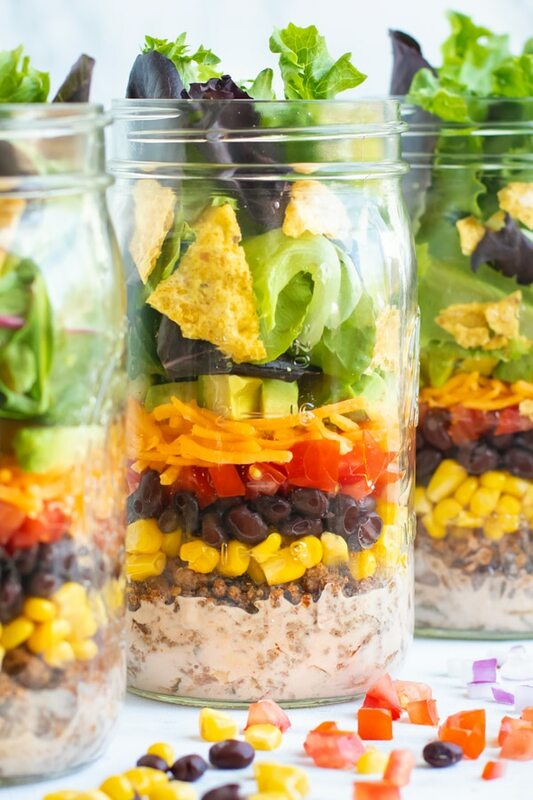 Take this Healthy Taco Salad to work or school in a super convenient mason jar! This easy mason jar salad recipe is a gluten-free and easy work lunch that you can prep-ahead for the week! In a large skillet over medium heat add olive oil and chopped red onion. Saute for 3-4 minutes or until almost cooked through. Push onions to the side and add lean ground beef. Saute for 7-8 minutes or until cooked through. 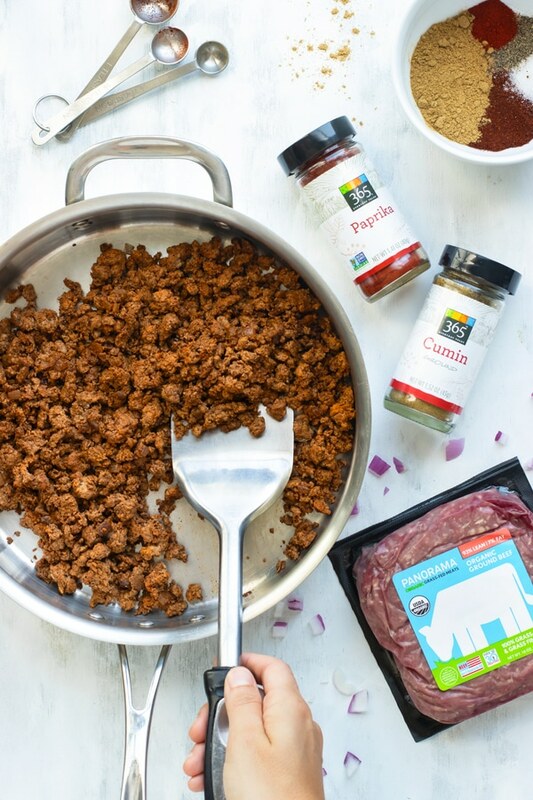 While beef is cooking mix together cumin, paprika, chili powder, salt, pepper, and cayenne pepper in a small bowl. Once ground beef is done cooking, turn off heat and add seasoning ingredients. Mix to combine. Using a potato masher or the back of your fork, crumble the ground beef to your desired consistency. In a small bowl whisk together the salsa and ranch. In four 24-oz. 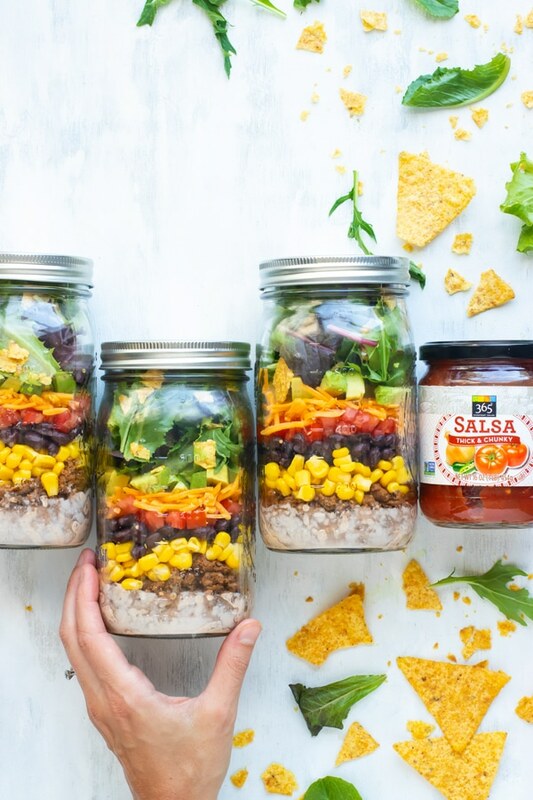 wide mouth mason jars add equal amounts of the salsa-ranch, ground beef mixture, corn, beans, tomatoes, and cheese. Store in the refrigerator for up to 5 days. 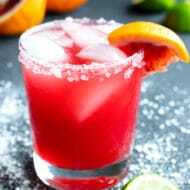 Shake mason jar well before pouring contents into a large salad bowl to enjoy. *Use dairy-free Ranch dressing and cheese for a dairy-free taco salad recipe. **Bring the tortilla chips and avocado separately to maintain the most freshness. ***If you want to have warm ground beef on your salad simply empty out the contents on the top and then heat up the ground beef and taco salad dressing just before serving. Want more recipes like this Healthy Taco Salad recipe?